How much fun is this toy for the summer? 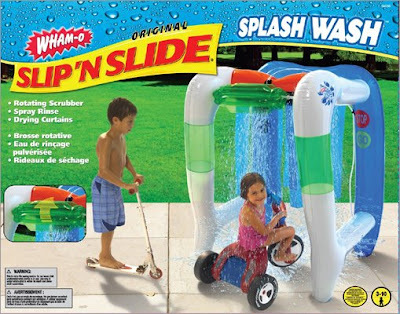 You now have the opportunity to win this Wham-O Kid Car Wash Slip 'N Slide in this wonderful giveaway! What a fun way to keep cool and have fun on those hot summer days that are right around the corner. Your child/children will want to go outside, just think of how imaginative and creative their play will be. This toy is sure to become a fast favorite and one they will remember. Check out our sponsor of this giveaway to see all of the other wonderful toys they offer. One (1) lucky winner will receive the Wham-O Kid Car Wash Slip 'N Slide valued at $54.99. Shipping is totally FREE to you! The giveaway will start today Saturday June 6th and end June 20th at midnight. 1) Leave a comment on how much your child/children would enjoy this item. 2) Blog about our contest on your blog, the leave me a comment with your post url. 3) Become a follower on Twitter and leave me a comment to let me know your Twitter name. 4) Become a fan on Plurk and leave a comment here to let me know your Plurk name. 5) Subscribe to my RSS feed and leave a comment here to let me know you've joined. Please note: Your email address MUST either be in your comment or available on your blogger profile or your entry will NOT count!! Anyone who has a valid US and Canadian mailing address. OMG... yes, my kids would love this and play in it for hours BUT... I could get them to wash the dogs in it! What a blast that would be, a doggie carwash! My kids, neighbor kids, and my kids cousins...Would have the time of their life with this! I have never seen this before! Too fun...wish I would of had one as a child! We have a pretty small yard so this would work GREAT!! I thank you so much for the chance! I'm crossing my fingers! I just Subscribed via my google reader! SO I know we'd play with it a ton, but I'd be half tempted to keep it in a box for when my 21 year old brother eventually has kids. We used to make this type of thing all the time when we were kids and pull each other through the high mounted hose while we were in a plastic tub my dad had brought home from work. I have two daughters and a dog who would love this!!! This is so much fun!! !